We look back at how golf fashion has evolved since the sport’s introduction to the U.S. Golf is a game mired in an arms race—not only as it pertains to equipment technology and course design, but also in the realm of fashion. Long gone are the days of golf outfits that simply served to protect against the conditions; the sport’s clothing industry has made a gradual transformation from tweed to moisture-wicking fabrics like Nike Dri-Fit, and today fashion on the green is equal parts function, performance and lifestyle. Not unlike the game itself, the sport’s style traces its roots back to Scotland where men and women dressed for a game of golf essentially the same way they would to attend any outdoor activity. Through golf’s migration to the United States in the 19th century, the tradition of the old country held true. In the late 1800s and into the early 1900s, knickers, long skirts, heavy jackets, starched shirts and blouses adorned with neckties were the norm. Through the decades, golf fashion imitating business fashion continued to advance, with heavy and extension-limiting clothing being replaced by more breathable and moveable textures into the middle of the 20th century. By the time modern greats like Arnold Palmer, Jack Nicklaus and Tom Watson arrived on the world stage, golf style had transformed to more casual, trendy and performance-based pieces of equipment that doubled as a workplace and lifestyle fashion choice. “It’s important that what we do translates not only to the golf course, but also to facets of life,” says Mike Bowers, vice president of design and merchandising at Peter Millar, which offers premium golf apparel for men and women. “Something as simple as a performance golf shirt translates to work wear, translates to everyday life, to soccer games on Sundays. … It’s appropriate for golf as well as any other situation.” Here, we look back at how golf style has evolved. When golf crossed the Atlantic, the traditional style followed it. Through the mid-to-late 1800s and into the early part of the 20th century, the Scottish roots of the game dictated the clothing. The popular plaid print was inspired by Scottish tartans. Thick and sturdy pieces designed to fend off wind, rain and seawater blown onto the course often resulted in caps for warmth and tweed jackets covering starched shirts and neckties. Below the belt, knickers and plus fours (pants that ended below the knee) were worn by men with long stockings leading into sturdy, weather-defending shoes. Women wore similar starched blouses and jackets, but the ensemble was completed with long, thick skirts that could keep them warm and dry during a round. These outfits served their purpose for protecting against the elements, but fell well short in the golf performance department. The inflexible collars and thick jackets impaired a full and complete turn, and unless they were equipped with nails (the earliest form of cleats), the sturdy shoes did not fare well on the often slick, firm ground. As American culture separated itself from its European ancestry, so too did its fashion. Like many things, however, there were hangers-on, and the golf world had its fair share. The likes of Bobby Jones, Gene Sarazen and Walter Hagen (pictured, far right) mixed and matched some of the traditional garb with more practical and comfortable pieces of apparel. By the early 1930s, much of the stiff tweed jackets and caps that were employed to battle seaside weather had been replaced. Knit cardigans and Norfolk jackets offered a respite for golfers playing in temperatures much warmer than those in Scotland. But ever the posh game, sometimes the remnant plus fours and neckties harkened to the tradition of previous generations. It was in the post-Depression era, however, that the intersection of golf and business style began to take hold, as some golfers went straight from the office to the course. Trousers started to replace knickers and plus fours, and more contemporary fabrics started to appear. While golf style continued to imitate society, the Americanization of golf clothes followed into the middle part of the 20th century. The last bastions of Scottish fashion began to fade out and a precursor to a more modern look began to take hold. With temperature-appropriate and lifestyle-accurate apparel entering the marketplace, a step down from business casual became the norm on the golf course. Fashion took on a more practical stance when it came to weather. 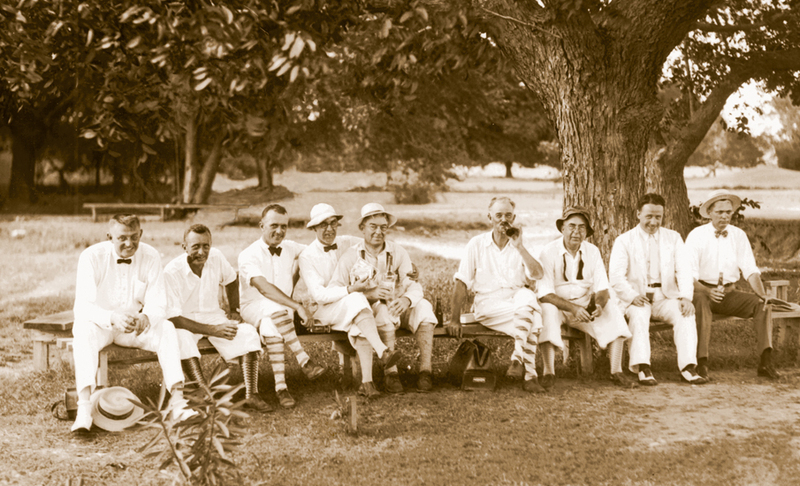 Lightweight shirts and pants were used to beat the heat, but while shorts were sometimes worn in casual circumstances, they were uncommon (in fact, they still aren’t permitted for PGA TOUR players). Jackets became more functional in the swing, providing ample room in the shoulders while staying snug around the waist, and were even available in water-repellent cotton. Women’s clothing advanced as well, moving from the restrictive long-sleeved shirts to freer-flowing short sleeves. 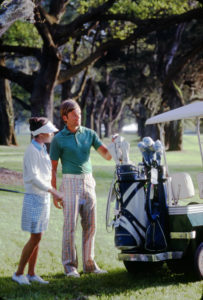 Skirt hems moved upward (see LPGA co-founder Patty Berg, pictured right), and pants became acceptable (see longtime Sea Island instructor and LPGA co-founder Louise Suggs, pictured left). The 1980s style tended towards individualism. 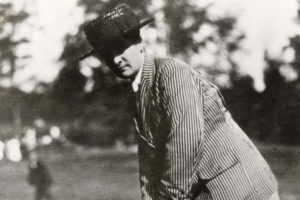 As fashion took on an increasingly important role in self expression in the latter part of the 20th century, that mindset filtered onto the golf course as well. Personal style became more prevalent in golfers’ wardrobe choices. In place of the more traditional muted tones, the vibrant colors that first appeared on golf courses in the 1950s became even more popular. Color explosions entered American living rooms as fans watched the best players in the world wearing vibrant hues and unorthodox combinations on television. And, eventually, some of that golf fashion even infiltrated the office. From a purely materialistic standpoint, steps were made to make the golf swing easier and freer, thanks to advancements in another country club sport—tennis. Stretchy knit cotton shirts improved performance, and shoes also became more flexible. Further, the cultural realities that golfers deal with today demand a crossover appeal in all forms of golf fashion. Golfers, both the weekend warriors and PGA TOUR pros, want to be able to arrive at multiple destinations and be properly and appropriately clothed. As we’ve seen throughout history, the styles donned by professionals (like Scott Pinckney, pictured above) trickle down into what the average golfer wears. The modern versatility of golf fashion goes hand-in-hand on the tee, in the office or out on the town.